Digging the garden and pulling out weeds by hand is undeniably one of the most strenuous aspects of gardening. A power cultivator, otherwise known as a rotary tiller, comes to the aid here and is an ergonomic alternative to the spade. It loosens the soil and makes it ready for sowing. At the same time it also works weeds, mulch, humus or compost into the soil, so ensuring that the soil is provided with nutrients. 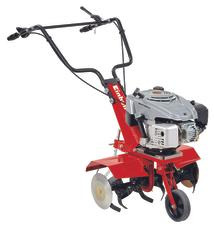 For a cultivated dig at your garden, you can choose between between petrol-powered and electric power cultivators. The petrol models have rather more power, while the electric rotary tillers are lighter, quieter and more environmentally friendly.